T.I. were arrest in West Hollywood after being pulled over for a traffic violation. In the event of being stopped the officer claimed to have smelled marijuana and subsequently proceeded to search the vehicle where other controlled substances such as ecstasy and other methamphetamine were found. They were taken away in two separate squad cars and later released on $10,000 bail. 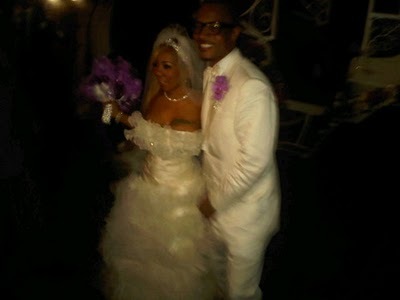 I LOVE TINY AND TIP....I think their relationship is epic but this is a little out there for me. Although they don't have to worry about tarnished resumes, they do have children and this behavior is somewhat unacceptable. Being the loyal person I am, I think I would def ride for my man but being down with what he does and joining him in it? Idk about that. Not condoning the situation but I respect Tiny for holding her own. I don't know what was going on in that car and it doesn't matter to me. I still love them. The couple was married a couple weeks ago in a beautiful private ceremony and this is one marriage who's longevity I don't even question; I think they will last. T.I. just came home and hopefully this doesn't cause him to have to go back to jail. He was arrested in 2009 for attempting to buy guns and silencers before the BET Awards and served a little time. He is currently fulfilling a probation sentence and this new felony charge is a violation; let's hope this doesn't cause him to go back.